The photographer, M.F.A. 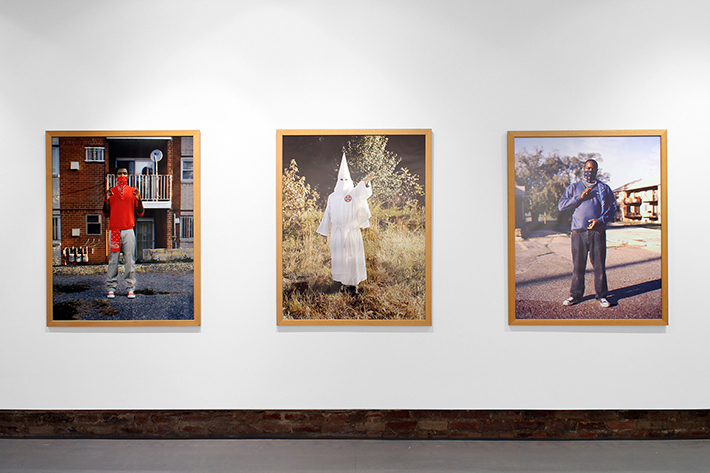 ’12, discusses the role race and identity play in his conceptual images. Larry Cook, M.F.A. '12, has showcased photos at galleries throughout D.C.
Underneath the glossy surface of each photo, there’s a challenge. Photographer Larry Cook is deliberate about confronting race and identity in his images, but his work goes beyond social implications. He urges viewers to look deeper and think harder—and he often delivers messages with a relentless, powerful blow. Take his photo “All American,” a jarring image by all accounts: On the left, there’s a figure in red clothing associated with Los Angeles street gang the Bloods; on the right, there’s someone in the blue worn by rival gang the Crips; and at the center, there’s a Ku Klux Klan member dressed in all white. Mr. Cook created “All American” while ruminating about the country’s history of violence. News channels across the nation were buzzing with coverage of Trayvon Martin, the Florida teen shot by George Zimmerman in 2012. The media frenzy made Mr. Cook wonder why interracial violence became sensationalized, while black-on-black and white-on-white crimes were seemingly ignored. Mr. Cook's piece, "All American." “I wanted to take these faces of violence and put them on the same level to force people to make connections they probably wouldn’t make otherwise,” he said. “All American” marks one of Mr. Cook’s first forays into conceptual art, which he began exploring while earning his M.F.A. at the George Washington University. Mr. Cook graduated in 2012 and has since built a strong following in D.C. His photographs and video installations have shown at the Corcoran Gallery, the Hemphill Gallery of Fine Arts and Baltimore’s internationally renowned Walters Art Museum, among others. If you had told him as a teenager that he’d be exhibiting photos all over D.C., he wouldn’t have believed you. His first love was basketball, a sport he played throughout high school in Prince George’s County, Md. But when he started college at SUNY Plattsburgh, he wanted to express himself creatively. He got his hands on a camera his freshman year. Even during that early introduction to photography, there was something unique about Mr. Cook’s pictures. He’d go back to the D.C. region and shoot photos of homeless people to tell a different story from his classmates—to capture a shot no one else had. “The themes have always been there, I was just trying to find a way to articulate my ideas more clearly, open up the dialogue and provide multiple entrances into the work,” he said. After college, Mr. Cook still felt he had room to grow as an artist and became interested in teaching. He was accepted into the George Washington University’s M.F.A. program, and shortly after, began exhibiting in D.C. He almost missed his very first show. Mr. Cook was taking photos of single mothers in D.C. at the time, and he submitted two portraits to an artists’ call at Galerie Myrtis in Baltimore. He made it into the exhibit, but his notification letter accidentally went into his spam email. It wasn’t until the gallery sent out a press release that he realized his photos would be on display for the public. “I was like, ‘What? Is this a mistake?’ I had to scramble to get the piece framed and everything—but it was my first exhibition and a learning experience,” he said. Throughout grad school, Mr. Cook moved from documenting subjects to directing more conceptual shoots, using costumes, videos and other elements. The evolution got Mr. Cook noticed. He was named a finalist for the Janet and Walter Sondheim Artscape Prize Finalist in 2013, and turned heads this January when his solo show “From an Eighth to a Key” came to the Hamiltonian Gallery. The exhibit included photographs he took of black males in graduation regalia. 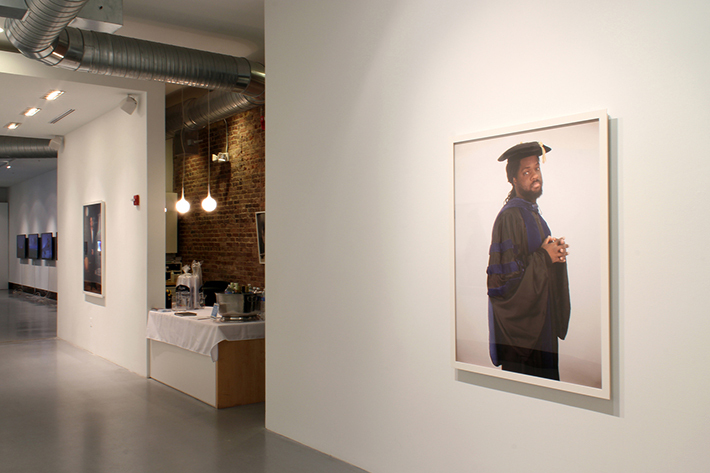 Photos from Mr. Cook's "Regalia" series at the Hamiltonian Gallery. These days, Mr. Cook can be found in D.C., setting up photoshoots, going into neighborhoods with his camera or scanning texts by Ralph Ellison or W.E.B. Du Bois for inspiration. He finds subjects wherever he goes, capturing images of people he sees on street corners or at convenience stores. Mr. Cook sometimes thinks about moving to New York or Los Angeles, but his connection to D.C. makes him apprehensive. He wonders if his work will change if he leaves the city and the people that have inspired him so much. Teaching is still at the top of his agenda—he led an “Intro to Color” class at GW last semester. He’s also raising funds for a neon light installation to use in “Converge,” an exhibition that will premiere Aug. 8 at the Hamiltonian Gallery, where he is a fellow. New mediums, especially video, continue to compel him and open doors for types of art he might try later in his career. “I always saw photography as the first avenue to express myself. I’ll absolutely still be teaching, but maybe in the future, I’ll also be doing film or anything that reaches the people in the way I want,” he said. 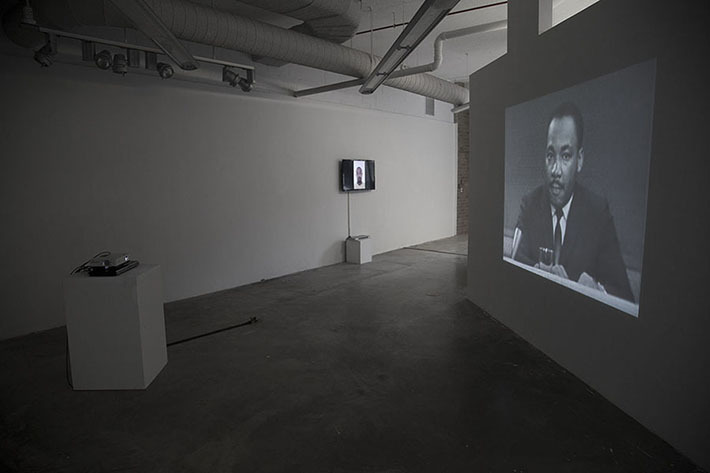 A video from Mr. Cook's 2012 thesis show at GW.